Last semester two of my friends and I made some sort of a search engine for Hackernews and Reddit. The idea was to collect all articles published on those two platforms and search them for trends. It should be possible to type-in a certain keyword such as “Bitcoin” and retrieve a trend chart showing when and how many articles have been published to “Bitcoin”. The result was TechTrends. 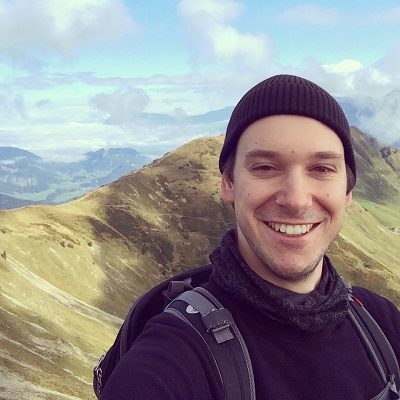 Based on Radim Řehůřek’s Gensim (a Python framework for text classification) we build a web application which crawls Hackernews and Reddit continuously and offers a simple web interface to search trends in these posts. You can find more posts about TechTrends here. Positive, which means that most of the comments are praising the article. Negative, which means that most of the comments are criticizing the article. Neutral, which means that there is a balance between positive and negative comments. I gave it the code name OpinionTrends. The basic idea was to train a supervised classifier to categorize each comment and therefore each post. This should work similar to a spam filter in an email application: Each email marked as ‘spam’ will train a classifier which can categorize emails on its own in good or bad (which actually means spam). I wanted to do the same but with comments instead of emails and with three instead of two categories. A classifier is only as good as its training data. In case of a spam filter the training data are emails marked as ‘spam’ by the user. This makes the training data very good and very individual to each user. In my case I decided to use Amazon product reviews. Amazon product reviews are a great way to retrieve training data. They are marked with stars in 5 categories, they are available in many languages and for many domains and you can crawl them very easily. The only thing you have to do is to sign up a free developer account on Amazon and get started with your favorite language (there are libraries for most common languages out there). Once the classifier is trained, it can be saved to a file and used further on. It doesn’t need to be updated anymore. However, the performance of the application depends completely on the classifier. Therefore it should be trained and tested carefully. I tested different classifiers and different pre-processing steps of the Amazon Reviews. Below you can see a comparison between a Bayes Classifier and a SVM. The SVM beats the Bayes Classifier by 10% or more. However, its performance also depends dramatically on the pre-processing of the raw reviews. I don’t have a huge number of tagged blog posts and comments to compare them with the results of the classifier. Comments are very subjective. In many cases you can not decide for sure whether a comment is positive or negative. Some few comments are very clear and easy (I hate your article. ), but a lot of comments are something in between (I love your website but I hate the color.). Even I as a human beeing can not decide if they are positive or negative and if I could decide it my friend would argue with me. OpinionTrends is in its last steps since a couple of days. Next week will present it at the Media Night of my university (a fairy for student projects). You can read more about it here. OpinionTrends works the same as TechTrends. You go to the website, type-in a keyword and get the results. The only really new thing is a brand new tab on the result page. When you click on it you will see a new chart similar to the blue one on the Timeline tab. The chart has three colors and is very easy to read. 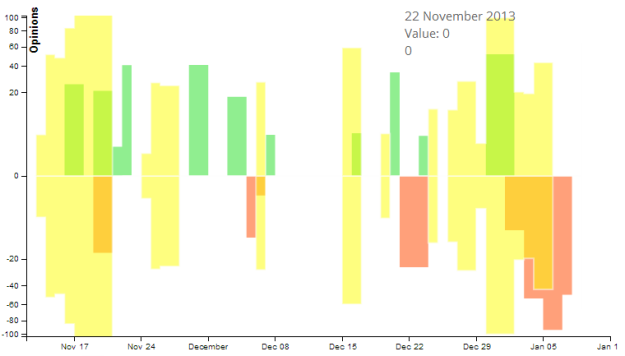 The green bars represent the positive articles, the red bars represent the negative articles and the light yellow bars represent the neutral articles. 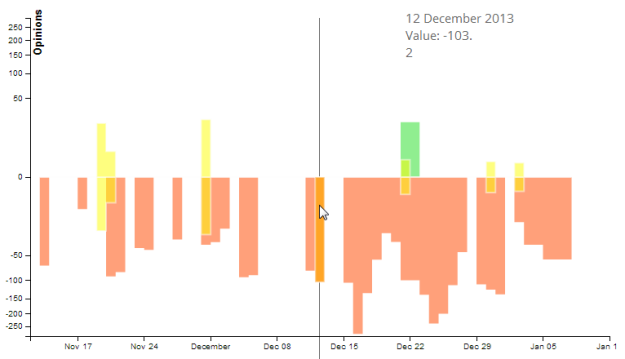 The neutral articles are visualized on the positive scale and on the negative scale with same amount. Above you see the result for NSA, which is actually a very good example since the overwhelming opinion about the NSA is very negative which you can see perfectly in the chart. You can click on each bar to see a pop-up showing the articles behind the bar. 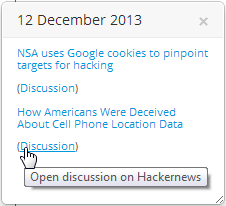 You can jump directly to the article or open the discussion with all comments on this article. 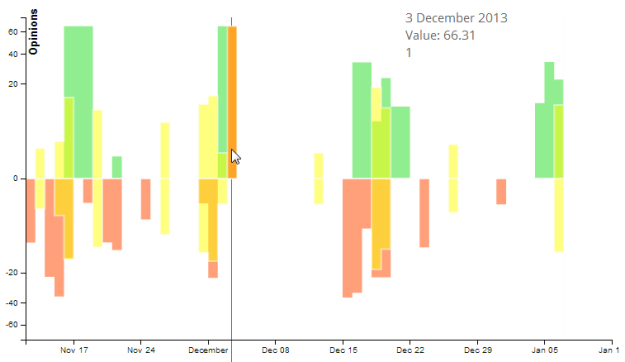 Here are some good examples to show you how OpinionTrends works. The best one I found so fare is a search for NSA. The opinion is very negative as everyone would expect. The opinion on Git is much more balanced. It has not only a nearly equal number of positive and negative articles, it has also a lager number of neutral posts. The opinion on Python is much better. Is has a lot of neutral posts, but beside them, Python has fare more positive than negative posts. OpinionTrends has some more features such as individual settings so adjust each search. However, I think this is too much for this post. You can get a lot more information directly on the project site. TechTrends/OpinionTrends is also open source, so you can checkout the source code from BitBucket. OpinionTrends is in its own branch! I hope you enjoy it and I would be really happy about some feedback.